Once you've made your own easy homemade granola, you'll be spoiled! Another bonus to shopping at our weekly farmer's market is the wonderful variety of fresh dried fruits and nuts available from our fantastic vendors. Wow- I feel truly spoiled to have year-round access to this local bounty, so I'm very happy to support them with my loyalty. 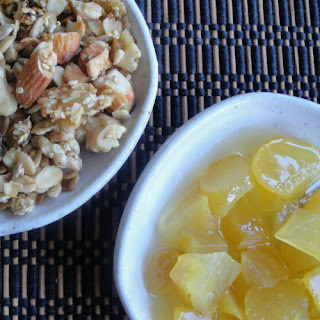 If you have access to locally grown dried fruit and nuts, this granola will turn out even better! I started eating granola again once I discovered how easy it to make it myself. Store bought granola is either very expensive for the good ones, and the not-so-good ones are too sugary or just taste awful (in my humble opinion!). I love it sprinkled over good quality plain yogurt, or by itself as a snack (warning: it's rather addicting too). I make it slightly sweet using only pure maple syrup and local honey, generously supplied by my neighbor as a trade for pruning her fruit trees. Here's my recipe below, adapted from my old and yellowing, but trusty Deaf Smith Country Cookbook (published in 1973). I make a large batch each time because it doesn't last long in my home. And it's quite flexible as to the amounts of dried fruit and nuts that you want add. Make it simple or load it up as I do with dried cranberries, mixed raisins, walnuts, almonds, sesame and sunflower seeds, and even a bit of candied Buddha hand lemon. First add 1/2 cup of a vegetable oil such as safflower oil and stir it in very well to coat the dry ingredients. Use the same measuring cup and measure 1/2 cup of pure maple syrup, or honey, or combine them so that they add up to 1/2 cup (I love the combination of maple syrup and honey). Add 1 teaspoon of pure vanilla. Mix these into the granola and stir to coat very well. Line two baking sheets with parchment paper (trust me, you won't want to skip the paper!) and spread the granola mixture evenly onto the two baking sheets. It will make a thick layer, but I found that it works just fine if you bake the two sheets side by side for about 10 minutes at 335 degrees F*, then check the granola to make sure it's not getting too toasty or burning. Stir it up (the edges tend to brown more quickly) then return to the oven and bake a few minutes more (5 to 10 minutes). Tip: make sure you set a timer to remind you because a few minutes makes the difference between pleasantly toasted and burnt! *You may have to test your oven and see if you need to bake at a lower or slightly higher temperature. Tip: I let the baking sheets cool on racks set on my counter top. As the trays cool, stir the granola to break up the clumps. Wait until it's completely cooled before storing in an air-tight container (if you store it before it has cooled, it will get soggy- ugh!). As I mentioned, this recipe is very flexible, so feel free to experiment with the amount or kinds of fruit and nuts, and the level of sweetness. I don't even measure out the dry ingredients anymore and it turns out nicely each time. To my taste this recipe makes mildly sweet, very satisfying granola. I'm fortunate in that we can buy our dried fruit and nuts from our farmer's market so we have access to unusual and delicious varieties, and you can't beat the freshness. Enjoy! See my recipe and method for candied Buddha hand lemon here.